Aiki-Judo is truly a modern Martial Art based on philosophical principles and traditions adhered to in Aikido and the physical techniques of Judo. As a form of Martial Art, Aiki-Judo training emphasizes courtesy, respect, discipline, and a ‘never give up’ spirit. As a method of self-defence it is very effective. It uses throws, hold downs, arm locks and chokes as its main methods of subjugating an attacker. All Aiki-Judo’s movements rely on timing, balance and the correct application of force to be effective. Its techniques are often part of the curriculum for police agencies in Japan. As a fitness program it encompasses all the aspects of a fitness regime and encourages a healthy lifestyle of its participants. 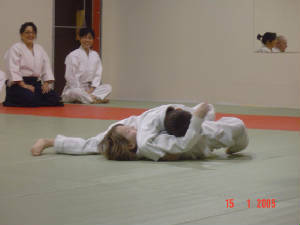 Aiki-Judo is not a sport but a martial art. Because its physical elements are based on the sport of Judo there is a competitive element used to develop technique. Students learn how to effectively do techniques in a free-style manner.